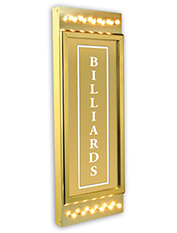 Game Room Signs are a collection of signs used by billiard parlors, arcades, game rooms, and movie theaters that have been updated for home cinema use. These game room identity signs are great décor pieces. Add authenticity and aura to your home game room by using a game room identity sign at the entrance to your gaming area and bring the game home.